An unusual visitor has been hanging out in the St. Lawrence River for the past three years: A narwhal, more than 1,000 kilometres south of its usual range. And it appears that the lone narwhal has been adopted by a band of belugas. An unusual visitor has been hanging out in the St. Lawrence River for the past three years: A narwhal, more than 1,000 kilometres south of its usual range. But the lone narwhal is not alone — it appears he has been adopted by a band of belugas. The narwhal — thought to be a juvenile male because of its half-metre-long tusk — was filmed in July playing among a pod of young belugas, thought to be mostly or all males. The video was taken by the Group for Research and Education on Marine Mammals (GREMM), a non-profit group dedicated to whale research, conservation and education based in Tadoussac, Que. "It behaves like it was one of the boys," said Robert Michaud, the group's president and scientific director. In the drone footage captured by GREMM researchers and posted on their website Whales Online, a pod of nine or 10 belugas swim closely together near the surface, rolling and rubbing against each other. "They are in constant contact with each other," Michaud said. "It's a like a big social ball of young juveniles that are playing some social, sexual games." The interactions between the narwhal and the belugas appear to be identical to those among just the belugas, suggesting the narwhal has been fully accepted as part of the group. Narwhals live in the icy waters of the Arctic, including those surrounding parts of Canada, Norway, Greenland and Russia. They typically don't range any farther south than northern Quebec's Ungava Bay, located south of the southern tip of Baffin Island. One was previously spotted in the St. Lawrence estuary by the Department of Fisheries and Oceans in 2003, according to GREMM. But sightings are rare enough that there was a bit of a buzz when the researchers aboard GREMM's boat, Le Bleuvet, spotted one on July 29, 2016, among a pod of 60 to 80 belugas. 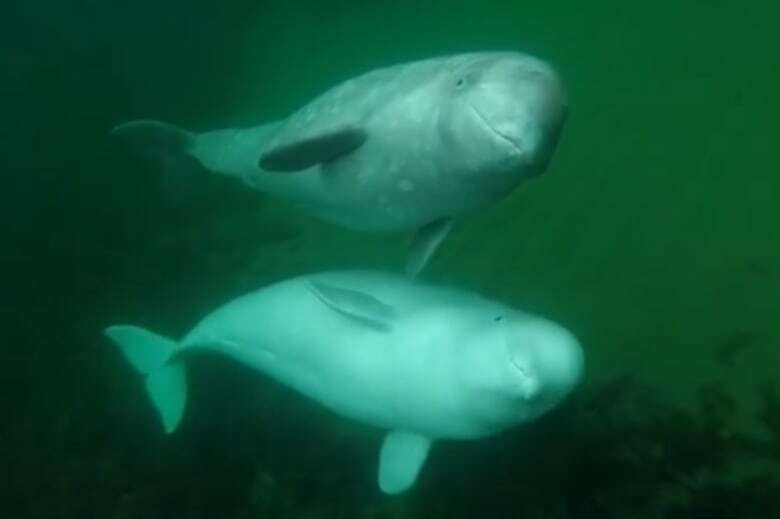 The researchers reported that it behaved like the belugas, even blowing bubbles from time to time, and drawing no special attention, except from one curious juvenile beluga. The same narwhal — identified from photographs of its unique markings — was spotted again the following year, in 2017, and three times this year, likely with the same population of belugas, some of whom are identified and named by GREMM. The group tracks and studies the whales from June to October, but loses track of them in the winter, when ice prevents GREMM from getting out in the research boat. The narwhal itself hasn't been named, Michaud said, as the group doesn't tend to name "vagrants" — "because we don't know when they will leave." So how did the narwhal end up in the St. Lawrence in the first place? Michaud said it's not unusual for young whales to wander into strange habitats. Young belugas, for example, have wandered as far as New Jersey and Nova Scotia. Some, unable to find their own kind, end up trying to make friends with boats and humans, and get fatally injured by propellers. "That little narwhal that made a similar trip was very lucky," Michaud said. "Because he found almost normal buddies." 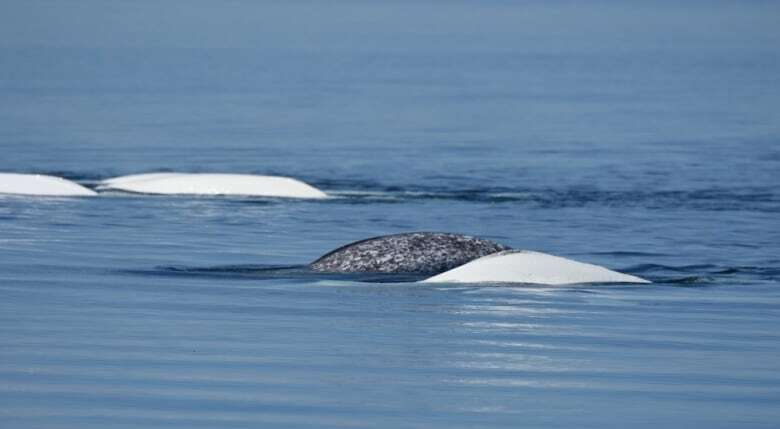 Kristin Laidre, a University of Washington researcher who has studied narwhals and other Arctic marine mammals for nearly two decades, said she's surprised that a narwhal has been spotted so far south — and interacting so closely with belugas. While beluga and narwhal habitats overlap in many parts of the Arctic, they're not observed interacting very often, and tend to be in different places at different times, especially in the summer. "Narwhals and belugas, though closely related, are pretty different," she said. Narwhals are good divers that hunt deepwater fish and more comfortable in areas that are covered in dense ice in the winter. Belugas prefer coastal, shallower waters with less ice, and prefer fish like salmon and capelin that swim close to the surface. But there are some similarities: they're both very social species, although few details are known about their social structures. And little is known about how similar their communication may be; both make a variety of clicks and chirps. There is some evidence that interaction takes place between belugas and narwhals from time to time. A study published in 1993 described the skull of what was believed to be a narwhal-beluga hybrid, with teeth somewhat similar to both, although that was never confirmed with DNA testing. The study was co-authored by Randall Reeves, a Canadian scientist and consultant with Okapi Wildlife Associates in Hudson, Que., who has been studying whales for 40 years. He, too, said belugas and narwhals tend to "stick to their own kind" when they encounter one another in the north. Nweeia, who has worked with Inuit in the Canadian Arctic and Greenland to gather traditional knowledge about narwhals and belugas, says there's an Inuit legend that puts a narwhal among belugas. In it, a woman hunting belugas falls into the water and her hair twists into a narwhal horn. 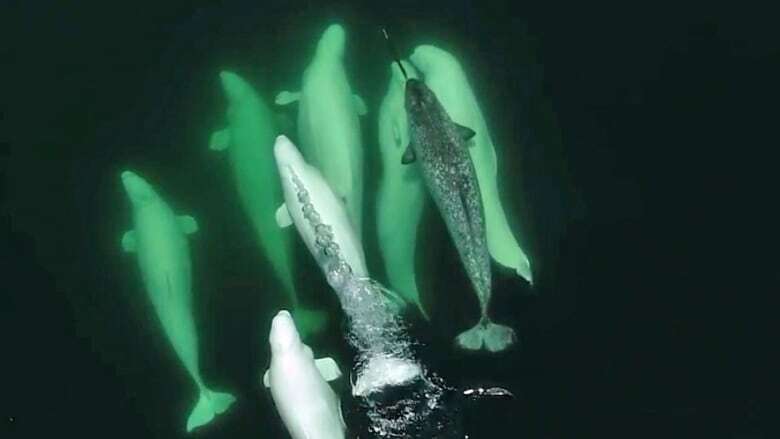 Nweeia's research team has also "observed the opposite," he said, spotting belugas swimming among narwhals in Arctic Bay, Nunavut. "I don't think it should surprise people," he said. "I think it shows … the compassion and the openness of other species to welcome another member that may not look or act the same. And maybe that's a good lesson for everyone."